By the end of 2007, John Bailey’s spiritual journey had bogged down. He no longer experienced bliss or the glimpses of enlightenment that once captivated him. To make things worse, his longtime marriage to Kat, his best friend and soulmate, had sunk into bouts of bitter quarreling. The following spring, John flew out to California from his home in Minnesota to meet with John Wheeler, the American non-dual teacher, at a Chinese restaurant in the Santa Cruz mountains. Though he’d been on a long quest, John had no idea what Wheeler meant. His words sounded too simple, too obvious for him to grasp. They’ve got nothing to do with the mess I’m in, he thought. At the time he had no idea those words would mark the beginning of the end of his years of seeking. Within weeks of his return to Minnesota, John’s life fell apart. His thirty-five year marriage collapsed. His finances tanked and his health careened downhill. In a hideous funk, despondent as life disintegrated around him, he would soon understand what Wheeler meant during their lunch back in northern California. After deeply investigating the source of his misery and his real identity, John recognized that at the root of it all lay a false premise. He saw that who he was had nothing to do with the dramas wreaking havoc on his life. Despite how bleak things looked, he felt an undeniable peace underlying everything. Even when that peace vanished with a momentary flash of anger or sadness, that too was alright. For at the core of his being he realized everything was unfolding perfectly. At last he found the serenity that for years had eluded him. John makes his home on the outskirts of St. Paul where he lives with his ex-wife and best friend Kat. Most mornings they hike around a nearby lake, keeping tabs on the frogs, turtles, deer, and egrets that live not far from the lake. John edited and published David Manners' Awakening from the Dream of Me. 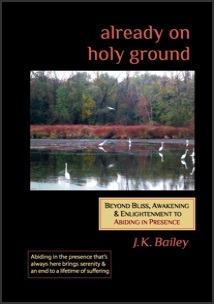 His last book, Already on Holy Ground (originally published by Hazelden), has recently been revised and made available through Amazon. His next book, Wise Ones: Words of the saints, sages, and mystic poets that point to oneness, presence, and an absence of suffering, is an anthology of enlightened wisdom from the 6th century B.C. until today.